Hypotheses of Theory of Disadvantages. 1) Disadvantage (D) is a stimulating motive of a certain designer to change the Engineering system (ES), where ESis a certain target-oriented and artificial system in general, which is able to perform the function. The main feature of ES is the presence of such elements, the individual goals of actions of which cannot be reduced to the function, which is performed by the ES itself. 2) The people develop ES in the direction of eliminating disadvantage (D), using for that the resources (R), which are most available (less expensive) at the moment. 3) Resources of engineering evolution (R) – that is all, which enables to create a new ES, embodied in a material product, which can survive at the market (be sold or be used with the obtainment of other profit at least by several users) at least during the period of one generation of this product. 4) Resources (R) could be classified according to basic categories of physics , chemistry and mathematics: SUBSTANCES, KINDS OF ENERGY (FIELD), TIME, SPACE and INFORMATION. 5) INFORMATION (I), from the standpoint of Theory of disadvantages, is everything, what is the parametric (measurable) description of operations with SUBSTANCES, FIELDS, TIME and SPACE, which are expressed in the reproducible change of varied parameters of material objects. Measuring is the procedure for defining the value of objective (independent from the personality, will and wish of the measuring person) quantitative or qualitative characteristics of a certain objet. 6) Each ES, which exists in nature, performs operations upon resources and can be described in the language of the model of engineering function: “object – action (verb) – subject”. Such placement implies that the resources, which are most often encountered in such descriptions in practice, are SUBSTANCES and FIELDS, while the “action” (expressed by a verb) reflects the nature of changes in values (or retention of values) of a certain important technical parameter, for example, “thermal field” – increases the length – “of a metal bar”, “tongue of the lock” – holds the door – “in closed position”. The criterion of correctness of transition to the language of parameters (and it means, of generation of heuristic force in the analysis) is the presence with the “object” and “subject” of volume, area, length, weight or other measurable parameters, which are characteristic of any of the kinds of energy. This restriction enables to avoid mistakes and not to use as notions “object – subject” such categories as “conscience”, “health”, “impression”, etc. In practice of applying this tool a list of 6 recommended basic verbs has been developed as well as of their synonyms for inclusion into the diagrams of functional modeling. The overall number of these verbs together with synonyms is approximately 100. 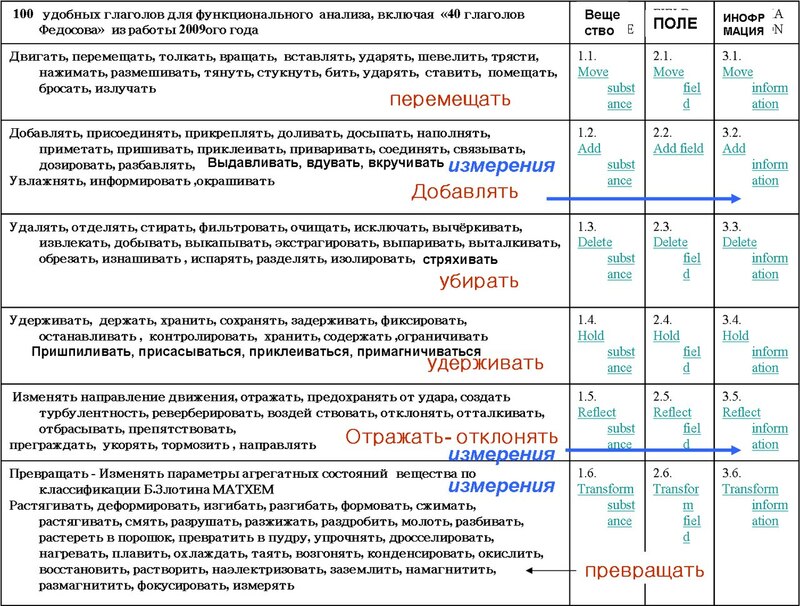 The list of recommended verbs in Russian could be found here. The list of verbs in English, Korean and Thai languages could be found here. 7) Our knowledge of performance level of engineering function are also related to the field of information: engineering function in terms of meaning of its action be useful, harmful or neutral, while the level of performance could be “normal”, “excessive” or “insufficient”. This classification is to some extent conventional and subjective, since it takes into account the demands and needs of a particular user, not “the human being in general”. The machine-gun is useful for the one who shoots, but is harmful for the one, who is the target of shooting. The presence of useful and harmful feature (function) with any object is explained by simple considerations of laws of preservation of energy, weight, pulse and the model of equilibrium of the world surrounding us as part of the philosophical dialectic approach in analysis. I will remind you of one of the private definitions, which was given by TRIZ author: “TRIZ is applied dialectic”. FUNCTION PERFORMANCE LEVELis the ratio between the actual and desired values of function performance characteristics. If the actual value is lower than the desired one, the level is considered to be insufficient, if it is higher, it is considered to be excessive, while if these values are equal, the level is adequate. Insufficient level of function performance is a non-desirable effect, excessive level is a resource for improvement of the object (in particular, one could somewhat deteriorate the function performance and (due to that) to decrease the expenditures proportionally). LEVEL OF EXPENDITURES ON FUNCTION PERFORMANCE is the ratio between actual and admissible value of expenditures on performance of - function. If the actual value is higher than the admissible, the level of expenditures is considered to be higher than the usual, if it is lower, it is insufficient, while if these values are equal, the level is adequate. Excessive level of expenditures is an undesirable effect, insufficient level is a resource for improvement of the object (in particular, one could somewhat increase the expenditures and due to that to improve the functioning). 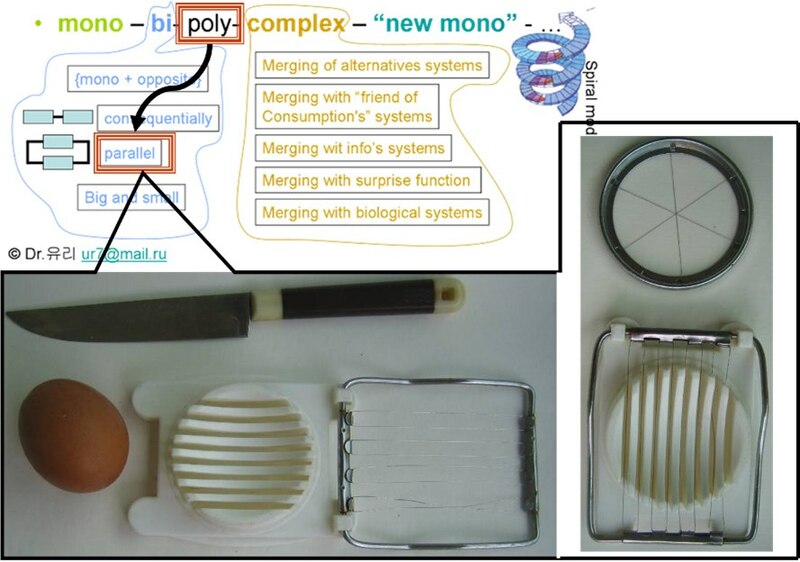 The stage of parametric analysis is aimed at identification of non-desirable effects, which are associated with the quality of performance of useful functions of the object and the expenditures on their performance. The information is entered into the table of functions, while the insufficient levels of function performance and excessive levels of expenditures are also included with the general list of non-desirable effects. A special kind of analysis is the identification of limits of the object’s evolution, based on artificial making the requirements to its functioning and level of expenditures more strict up to limit values (zero expenditures, physical limits, etc.). The problems identified thereby point out the perspective directions for improvement of the object, while the solutions, directed at elimination of these problems, enable to obtain a long-term forecast of the object’s evolution. 1. We are digging a pit, while the extracted earth is needed in 5 meters from the pit. Using a spade, we can throw the earth at a distance of only 3 meters. The level of execution is insufficient one has to throw the earth in portions once again. 2. We cool vodka in a portable refrigerator. Theambienttemperatureis +40. Vodkaremainswarm. 3. We are sailing against the flow. The motor of the boat is weak, while the flow is strong. We are carried backwards by the stream instead of sailing forward. 1. Wearemakingaholeinthewallusingaperforator. The wall is thin, the bore is thin, while the force of the strike is great. The bore penetrates through the wall. A piece of concrete gets separated from the opposite side of the wall and falls down. 2. We are making an omelette. We are breaking an egg against the edge of the saucepan. We overdid! The egg is broken by the edge of the saucepan at both sides. Half of the egg is in the saucepan, while another half lies on the floor. 3. We are taking a book from the bag. It gets stuck, being jammed by something. We pull harder. The book slips out and because of inertia flows into the ceiling. 4. We are hammering a nail into a gypsum cardboard with a heavy hammer. The nail is hammered, while there is a recess from the hammer in the surface of cardboard. It is easy to notice that the problem of defining the levels is closely associated with the speculations and mental experiments. For example, as a result of mental experiment you find that ES “Door” in terms of its Main Useful Function (MUF) “closed door stops the proliferation of material objects” has a huge slot, through which cold air, noise and odors can penetrate, then, based on the results of this experiment you could identify “insufficient level of performance” of MUF as related to such components of your model as “cold air” (parameter “temperature”), “noise” (parameter Db), “unpleasant odors” (parameter “concentration of substance Х). Thus, you can identify the component in your ES, which is characterized by a “harmful function” – “slot under the door permits the motion (travel) of the cold air, penetration of noise and bad odors”. Level of “excessive performance” of function could also be identified based on mental experiments and speculations. For example, MUF of the ES “Table” – “The table holds the book and writing devices” is provided for through the presence of 4 legs with the analyzed object. Each of the legs has the function of “holding the panel of the table in horizontal position (parameter “coordinates in space”). In this case the presence of four identical functions could be classified as “excessive level of performance”, because as a result of mental experiment you can easily imagine a table with only one leg, holding the panel in required position. And if you imagine a table, on which there are very many books and writing facilities and the goal of your project is the improvement of technical parameters of the table, you can classify MUF as “insufficient”, bearing in mind small area of the table, which is insufficient for satisfying the needs of its user. The described method of analysis in constructing the function model of the processes for using ES certainly nears the disadvantage of subjectivity in constructing models, which is determined by: A) the level of imagination of the User, B) his or her ideas of “necessary” and “sufficient”, C) values, determining the relation of the User to Disadvantages (relevant/irrelevant, admissible/inadmissible). However, this forced subjectivism, as the practice of training shows, ceases to significantly influence the particular solutions, if the sufficient number of exercises are done in the field of such construction work. The disadvantage of this classification in the form of subjectivism is richly compensated bythe advantage in the form of a possibility to obtain an absolutely new treatment of your problem (system) from the standpoint of PHYSICS, which pre-conditions the appearance of powerful heuristics if the functional modeling method. Let us remind the reader that the main goal of functional modeling (describing the process of functioning of ES in the language of technical parameters) is the recording of all “functions” and compiling a list of identified disadvantages, using the notions of “harmful function”, “insufficiently performed function” and “excessively performed useful function”, which are necessary for performing the act of improving ES parameters and obtain a new design solution. 8) All knowledge, accumulated in classic TRIZ, and that is, first of all: Trends of Engineering systems Evolution, 40 techniques for resolving Engineering and Physical Contradictions and 75 standards for inventive problem solving are accumulated by TRIZ authors during 50 years of existence of TRIZ with one goal – “to eliminate D (disadvantages)”, since there is no other way in creating new ES. As a particular case, the creation of essentially new ES eliminates the disadvantage “impossibility of satisfying actual needs or wishes through existing means”. If these demands and wishes are not vital for anyone, the engineering system (in keeping with the definition given above) cannot be created. 9) TRIZ as a science, located at the boundary of natural sciences (physics, chemistry and biology), dialectics (philosophical sciences) and psychology of engineering creativity as the basic object of analysis uses Disadvantage in its three forms. The first form of describing D implies the use of the language of functions, the second form is an EC (Engineering contradiction), which implies the stabilizing of TWO important parameters, which influence one another in evaluation of the type “useful” and “harmful” and the third form – PC (Physical Contradiction), implying that ONE parameter is used for describing a D, and that two contradictory (opposite) requirements are given to it: a certain parameter should be great and small. Or even a certain “object should exist”, when it is necessary and “should not exist”, when it is not needed. In any case we are talking about a dychotomic approachin given requirements to the parameters. For example, an ES, which it is recommended to create in the form of a system of two assertions A (certain parameter P1 could be varied and it will lead to desirable variation of another parameter P2, however, it will cause the non-desirable variation of parameter P3) and B (variation of the same parameter P1 in the opposite direction will lead to desirable variation of parameter P3 and to non-desirable variation of parameter P2). This is like a swing in terms of meaning. A) The table surface (P1) should be large (+P1) and then we shall be able to arrange a significant number (P2) of books and writing instruments (desirable change: +P2), however, in this case we shall reduce the effective area of the room (P3) (non-desirable variation: -P3). 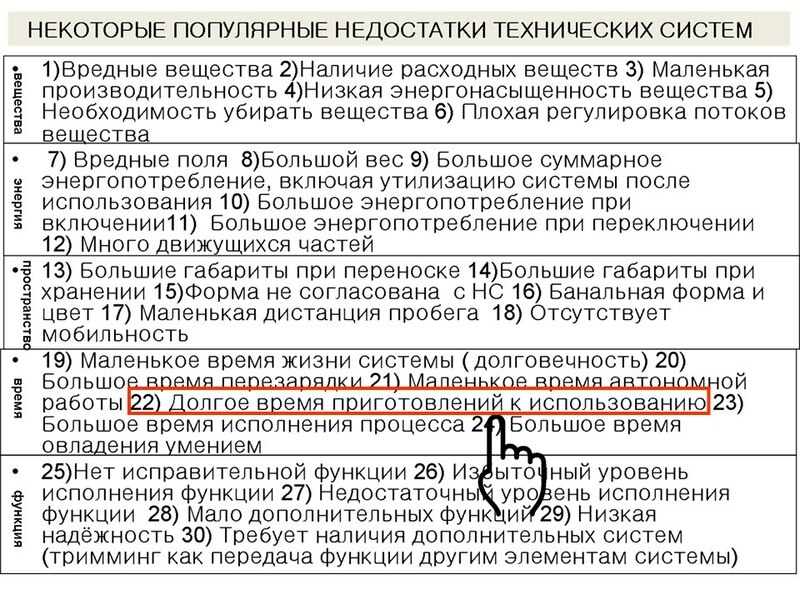 Б) If the table surface is small (-P1), it will increase effective area in the room (+P3), however, it will lead to non-desirable decrease in the effective area of the table (-P2), since it will generate difficulties in work, when you need a lort ofbooks as reference material (P2). PC for the described situation is as follows: The area of the table should be LARGE, when we use many books and should be SMALL, when we don’t use the books. (technique 15, Dynamization). Resolving PC. Technique 28 (rejection of mechanical system) invention of interactive table. 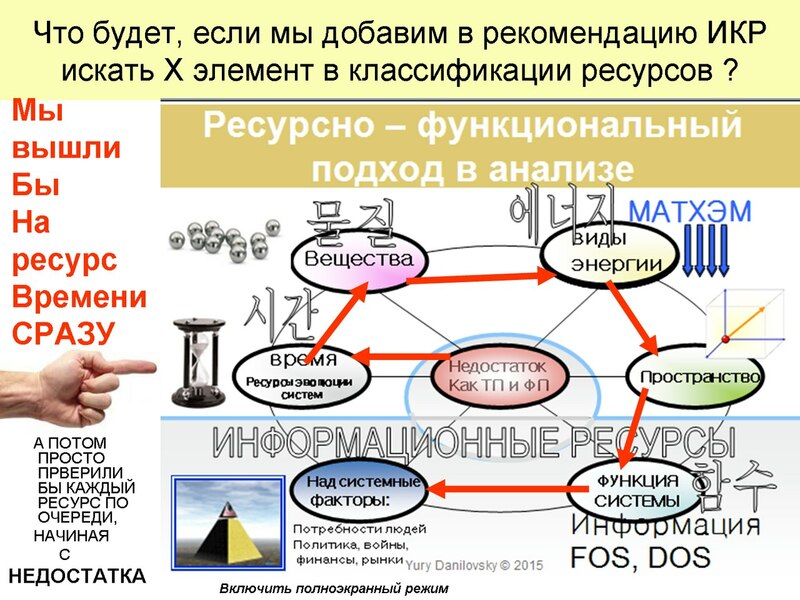 The triad 1) Disadvantage – 2) Engineering contradiction and 3) Physical Contradiction is a powerful heuristics and technology for creating new consumable goodsбwhich is supported by practical knowledge in the area of engineering sciences and the laws of dialectic. 1) Недостаток (Н) – побудительный мотив некоего конструктора изменить Техническую Систему (ТС). Где ТС это некая целенаправленно и искусственно созданная материальная система, способная выполнить нужное человеку действие по преобразованию материальных объектов (веществ и/или полей). Основной признак ТС – наличие взаимосвязанных материальных элементов, действия которых в отдельности не сводимы к функции, выполняемой самой ТС, а в совокупности достаточны для выполнения этой функции. 2) Люди развивают ТС в направлении устранения Н, используя для этого наиболее доступные (дешёвые) в данный момент ресурсы (Р). 3) Ресурсы развития техники (Р) это всё то, что позволяет создать новую ТС, воплощенной в материальном продукте, который сможет удержаться на рынке (быть проданным или использованным с получением иной выгоды по крайней мере несколькими пользователями) хотя бы в течение одного поколения этого продукта. 4) Ресурсы ( Р) можно классифицировать по в соответствии с основными категориями физики, химии и математики: ВЕЩЕСТВА, ВИДЫ ЭНЕРГИИ (ПОЛЯ), ВРЕМЯ, ПРОСТРАНСТВО и ИНФОРМАЦИЯ. 5) ИНФОРМАЦИЯ. ( И), с точки зрения интересов Теории Недостатков, это всё то, что входит в описание таких операций с ВЕЩЕСТВАМИ, ПОЛЯМИ, ВРЕМЕНЕМ, ПРОСТРАНСТВОМ, которые выражаются в воспроизводимом изменении измеряемых параметров материальных объектов. 6) Всякая существующая в природе ТС совершает операции с ресурсами и может быть описана на языке модели технической функции : «объект- действие ( глагол) – субъект». В такой постановке подразумевается, что : наиболее частыми ресурсами, на практике в таких описаниях являются ВЕЩЕСТВА и ПОЛЯ , а «действие» (глагол) отражает характер изменений (или сохранений) значений некоторого важного технического параметра, например « тепловое поле» - увеличивает длину – «металлического стержня», «язычок замка – удерживает (в положении закрыто) –«дверь». Критерием правильности перехода на язык параметров ( а значит и появления эвристической силы в анализе) является наличие у «объекта» и « субъекта» объёма, площади -длины, веса, или иных измеряемых параметров , характерных для любого из видов энергии. Это ограничение позволяет избежать ошибок и не использовать в качестве понятий «объект - субъект» таких категорий как « совесть», «здоровье», «впечатление» и тому подобное. В практике применения этого инструмента разработан список рекомендуемых основных 6ти глаголов и их синонимов для включения в диаграммы функционального моделирования. Этих глаголов вместе с синонимами примерно 100. Список рекомендованных глаголов на русском языке можно найти здесь. Список глаголов на английском, корейском и тайском языках можно найти здесь. 7) к области информации относятся и наши знания об уровне исполнения технической функции : т. функция может по смыслу своего действия быть : полезной, вредной или нейтральной, а уровень исполнения может быть «нормальным», «избыточным» или «недостаточным».Эта классификация в некотором роде условна и субъективна, потому что учитывает потребности и нужды конкретного пользователя, а не «человека вообще». Пулемет полезен для того, кто стреляет, но вреден для того, в кого стреляют. Наличие полезного и вредного свойства (функции) у любого объекта обуславливается простыми соображениями законов сохранения энергии, массы, импульса и моделью равновесия окружающего нас мира в рамках философского диалектического подхода в анализе. Напомню одно из частных определений автора ТРИЗ : «ТРИЗ это прикладная диалектика». УРОВЕНЬ ВЫПОЛНЕНИЯ ФУНКЦИИ - соотношение между фактическим и желаемым значениями характеристик выполнения функции. Если фактическое значение меньше желаемого, уровень считается недостаточным, если больше - избыточным, если эти значения равны - адекватным. Недостаточный уровень выполнения функции является нежелательным эффектом, избыточный - ресурсом для совершенствования объекта (в частности, можно несколько ухудшить выполнение функции и за счет этого пропорционально снизить затраты). Избыточный уровень затрат является нежелательным эффектом, недостаточный - ресурсом для совершенствования объекта (в частности, можно несколько увеличить затраты и за счет этого пропорционально улучшить функционирование). На этапе параметрического анализа выявляют нежелательные эффекты, связанные с качеством выполнения полезных функций объекта и затратами на их выполнение. Информация заносится в таблицу функций, а недостаточные уровни выполнения функций и избыточные уровни затрат - еще и в общий список нежелательных эффектов. Особым видом анализа является выявление пределов развития объекта, основанное на искусственном завышении требований к его функционированию и уровню затрат вплоть до предельных значений (нулевые затраты, физические пределы и т.п.). Обнаруженные при этом проблемы указывают перспективные направления совершенствования объекта, а решения, направленные на устранение этих проблем, позволяют получить дальний прогноз развития объекта. 1. Копаем яму, вынутая земля нужна в 5 метрах от ямы. Лопатой бросаем только на 3 метра. Уровень выполнения недостаточный - приходится лишний раз перебрасывать. 3. На лодке плывем против течения. Моторчик слабенький, течение сильное. Сносит назад вместо движения вперед. 1. Бьем перфоратором дырку в стене. Стенка тонкая, сверло длинное, удар мощный. Сверло проваливается сквозь стенку. Сзади из стенки вываливается кусок бетона. 2. Делаем яичницу. Разбиваем яйцо о край сковородки. Перестарались. Край сковородки прошел яйцо насквозь. Пол яйца в сковородке, а другая половина оказалась на полу снаружи. 3. Вынимаем книгу из портфеля. Она зажата чем-то. Тянем сильнее. Она сдергивается и по инерции летит в потолок. 4. Забиваем гвоздик в гипсокартон тяжелым молотком. Гвоздь забит, в поверхности вмятина от молотка. Легко заметить, что проблема определения уровней затрат тесно связана с рассуждениями и мысленными экспериментами. Например, в результате реального наблюдения либо мысленного эксперимента вы обнаруживаете, что ТС дверь относительно её Главной Полезной Функции (ГПФ) «закрытая дверь останавливает движение материальных объектов (внутрь помещения)» имеет огромную щель через которую может проникнуть холодный воздух, шум, запахи, насекомые и т.д. После этого Вы моделируете отношение пользователя системы к этим недостаткам, и если они для него существенны, то на основании результатов этого мысленного эксперимента вы можете определить «недостаточный уровень исполнения» ГПФ относительно элементов вашей модели « холодный воздух» ( параметр температура), «шум» ( параметр Дб), « плохие запахи» ( параметр концентрация вещества Х). Таким образом, вы можете определить элемент в вашей ТС, имеющий «вредную функцию» - «щель под дверью пропускает (направляет внутрь) холодный воздух, шум и плохие запахи». Уровень «избыточное исполнение» функции может быть определён также на основании мысленных экспериментов и рассуждений с позиции пользователя системы. Например, ГПФ ТС «стол» - «стол удерживает книгу и письменные принадлежности» обеспечивается наличием у рассматриваемого объекта например 4 ног, каждая из которых имеет функцию « удерживать столешницу в горизонтальном положении( параметр «координаты в пространстве»). В этом случае, наличие четырёх одинаковых функций может быть определено как «избыточный уровень исполнения», потому что в результате мысленного эксперимента вы можете легко представить себе стол с одной ногой для удержания, который будет требовать меньше ресурсов (материалов, времени, денег) на изготовление. А если вы представите себе стол на котором находится очень много книг и письменных принадлежностей и целью вашего проекта является улучшение технических характеристик стола, то вы можете определить ГПФ как «недостаточную», имея в виду маленькую площадь стола, недостаточную для удовлетворения нужд его пользователя. Описанный способ анализа при построении функциональной модели процессов использования ТС, безусловно, несёт в себе недостаток субъективности при построении моделей, который определяется А) уровнем воображения Пользователя, Б) его представлениями о «необходимом» и «достаточном», В) ценностями, определяющими отношение Пользователя к Недостаткам (существенно/несущественно, приемлемо/неприемлемо). Однако этот вынужденный субъективизм, как показывает практика обучения, перестает существенно влиять на конкретные решения при достаточном количестве проведённых упражнений в области таких построений. Недостаток этой классификации в виде субъективизма перекрывается достоинством в виде возможности получения абсолютно нового взгляда на вашу проблему (систему) с точки зрения ФИЗИКИ, что и обуславливает мощную эвристику метода функционального моделирования. Напомним читателю, что главной целью функционального моделирования ( описание процесса функционирования ТС на языке технических параметров) является фиксирование всех «функций» и составление списка выявленных недостатков, пользуясь понятиями « вредная функция», « недостаточно исполняемая полезная функция» и « избыточно исполняемая полезная функция», которые и необходимы для того, чтобы совершить акт улучшения параметров ТС и получить новое конструктивное решение. 8) Все накопленные знания в классической ТРИЗ, а это, прежде всего : Закономерности Развития Технических Систем, 40 приёмов для разрешения Технических и Физических Противоречий, 76 стандартов решения изобретательских задач обобщены и собраны авторами ТРИЗ за 50 лет её существоавания с одной целью – «устранять Н ( недостатки), потому что никакого другого пути в создании новых ТС не существует. Как частный случай, создание принципиально новой ТС устраняет недостаток «невозможность удовлетворения актуальных потребностей или желаний существующими средствами». Если эти потребности и желания ни для кого не актуальны, техническая система (в соответствии с приведенным выше определением) не может быть создана. 9) ТРИЗ как область знания, находящаяся на стыке естественных наук ( физики, химии и биологии) , диалектики (философских наук) и психологии инженерного творчества как основной объект анализа использует Недостаток в трёх его формах. Первая форма описания Н производится на языке функций ,вторая форма это ТП ( Техническое Противоречие), когда устанавливается ДВА важных параметра, влияющих друг на друга в оценках «полезно» и «вредно» и третья форма – ФП ( Физическое Противоречие) , когда для описания Н используется ОДИН параметр, к которому предъявляют ДВА противоположных требования: некий параметр должен быть большим и маленьким. Или даже некий « объект должен существовать» когда это необходимо и «не должен существовать», когда он не нужен. В любом случае речь идёт о дихотомическом подходе в предъявлений требований к параметрам. Например ТП, которое рекомендуется составлять в виде системы из двух утверждений А ( некий параметр П1 может быть изменен, и это приведет к желаемому изменению другого параметра П2, но вызовет нежелательное изменение параметра П3 ) и Б ( изменение того же параметра П1 в противоположном направлении приведет к желательному изменению параметра П3 и к нежелательному изменению параметра П2).Это похоже по смыслу на качели. А) поверхность стола (П1) должна быть большой (+П1) и тогда мы сможем разместить большое количество (П2) книг и письменных принадлежностей (желаемое изменение: +П2), но тогда мы уменьшим полезную площадь комнаты (П3) (нежелательное изменение: -П3). Б) Если поверхность стола будет маленькой (-П1), то это увеличит полезную площадь в комнате (+П3), но приведет к нежелательному уменьшению полезной площади стола (-П2), поскольку создаст трудности при работе, когда вам понадобится много книг для справок (П2). ФП для описанной ситуации : Площадь стола должна быть БОЛЬШОЙ, когда мы используем много книг и МАЛЕНЬКОЙ когда мы им не пользуемся. Триада : 1) Недостаток – 2)Техническое Противоречие и 3)Физическое противоречие является мощной эвристикой и технологией конструирования новых объектов потребления, опирающейся на практические знания в области технических наук и законы диалектики. У Альтшуллера всё то, что воспринимается как новые толкования и прочтения - БЫЛО, но только сегодня стало понятно как это превратить в описание пригодное для программирования. 3. Концепция курса «Повышение конкурентоспособности инновационной продукции» для студентов старших курсов специальности «Информатика и вычислительная техника» / В.А. Камаев, А.П. Тюков, Ю.Э. Даниловский, О.А. Хржановская // Перспективы развития строительного комплекса: матер. IX междунар. науч.-практ. конф. (г. Астрахань, 27-29 окт. 2015 г.) / Астраханский инженерно-строительный ин-т [и др.]. - Астрахань, 2015. - C. 67-72. 9. 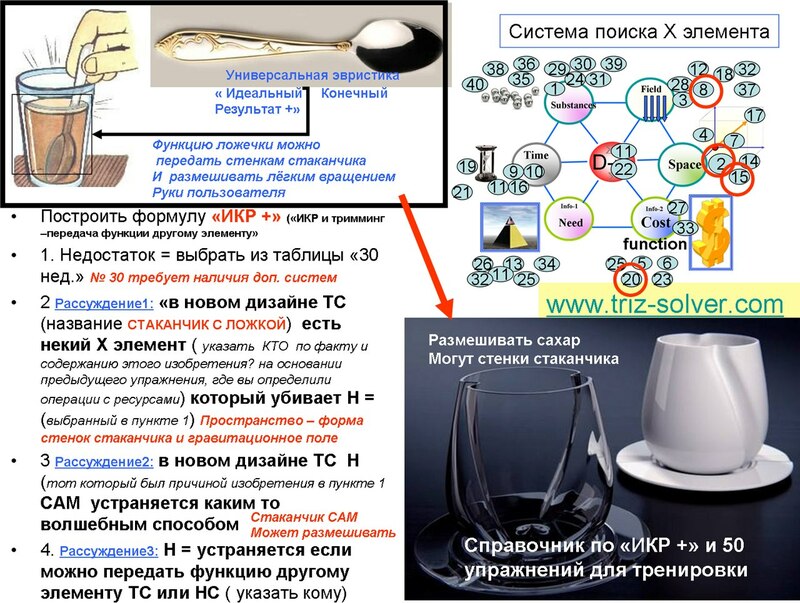 TRIZ SUMMIT Kiev 2013 ,Diagnostics and Training of the Inventive Thinking Level based on the Reference Book on Disadvantages. (Disadvantage Oriented Search).